I'm finally exiting that annual September stretch where work obligations keepe from catch much college football. 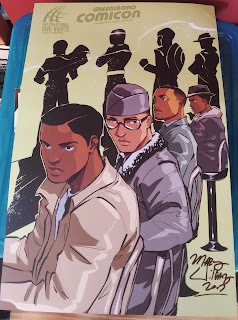 This past weekend I got got to let my feel flag fly on another way: at Greensboro Comicon. The convention had quite a few local sponsors, but the one that led to the coolest crossover was the International Civil Rights Center and Museum. Situated just down the street from where the convention took place, the ICRCM commemorates the site of the Woolworth's where the Greensboro Sit-In took place. 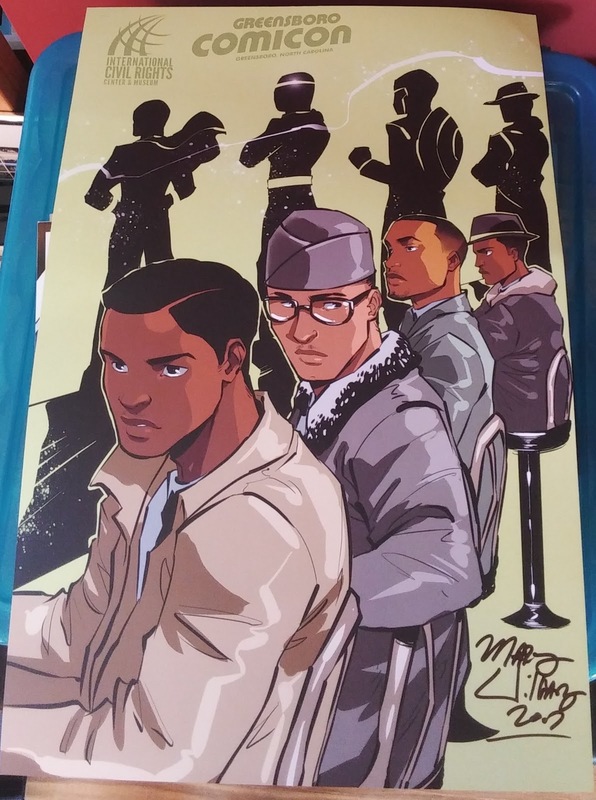 For the event, Tuskegee Heirs' illustrator Marcus Williams created an awesome print of the A&T Four as heroes that was available at the con and with VIP admission. The print, pictures above, is about half of the reason I decided to go, and 100% of the reason I got the VIP admission. To bring it full circle: On that same Saturday, Greensboro's NC A&T Aggies were out of town. The football team and the Blue and Gold Marching Machine had traveled south to Charlotte to take on the 49ers and ultimately notch a victory against the FBS squad. As ESPN's Ryan McGee brought to my attention, the touchdown that put the game out of reach for the Niners was an interception by Franklin McCain III - the grandson of the A&T Four's Franklin McCain.